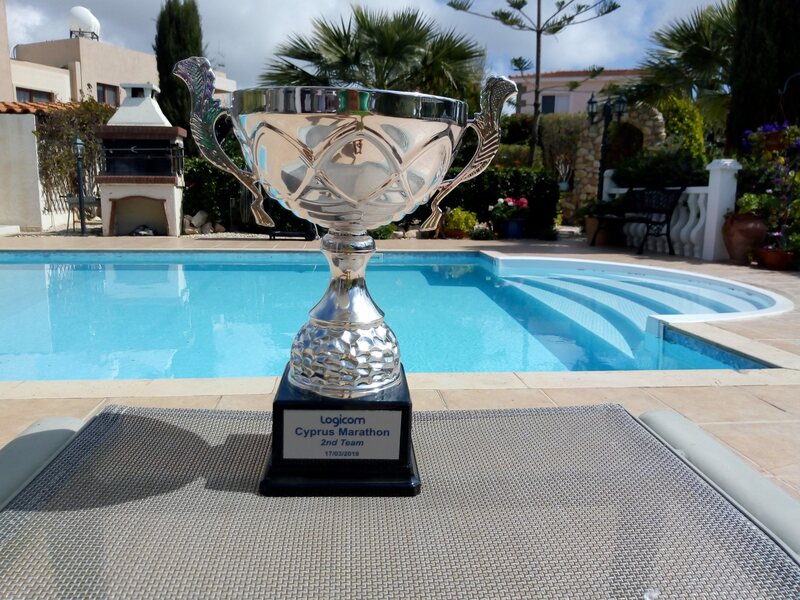 Well as another club overseas trip, the 18th, comes to an end maybe time to reflect on the Redway Runners time in Paphos for some sun, sea, food, beers and even some running! The Friday saw the 5K wine run and think we all had visions of running in the sun around a winery, passing through the vines, then sitting in a big grassy area drinking wine and more wine, well the reality was slightly different as we boarded the coaches early in the morning with the temperature gauge showing 16 degrees, but as the coach went into the hill and the mist it went down, down and down further settling at a chilly 10 degrees and driving rain. But the rain stopped for the run and this was all along roads around the area, not what had imagined but still a good morning and plenty of fun Special mention to James who was second home and Katie first lady and got the magnum of wine. 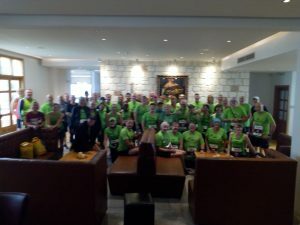 Sunday was big race day for the 21st Logicom Cyprus Marathon with a marathon, half marathon, 10K and 5K we had Redway Runners taking part in each of the races and arriving at the start of the race it was like any local event with green club tops everywhere. 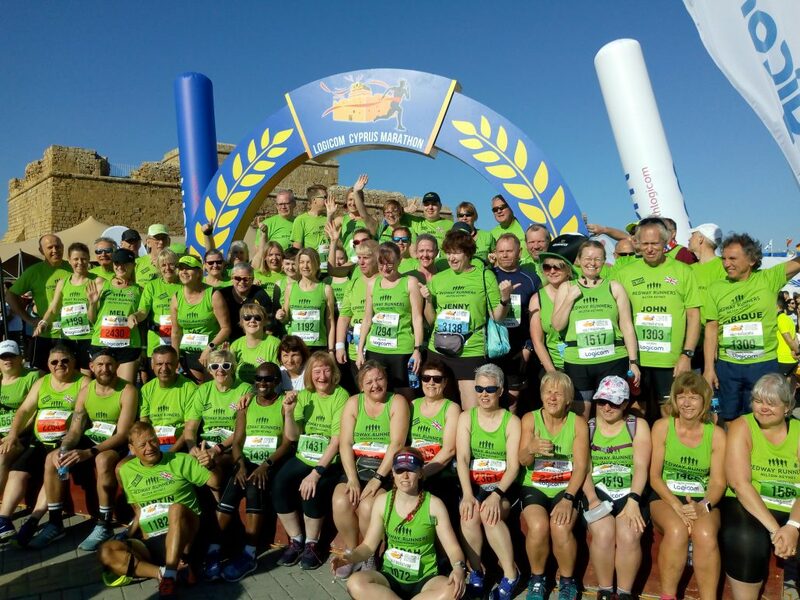 The half marathon course was an out and back route along the main carriageways around Paphos, but good to spot lots of Redway Runners on the out and backs. After the event, many Redway Runners seemed to enjoy the free beer and watched the awards being presented in the sun. Team Redway Runners came second in the Marathon team event and third in the half marathon team event. Special mention for Redway Runners winning awards with Abi Gooch coming in as first lady in the marathon in her second home town and in front of a very proud mum. Katie Tucker was third in the women’s half marathon race. Sarah King and Sadie Hursey bought home age category awards – well done to all of them. Often these runs are about the personal stories and with so many running must have been many, but well done to James Down who was first Redway Runner home in the half in just over 90 minutes, but before the run had done a little 7 mile run, then there was Amy Croker who completed her first half marathon, not a bad place to start and it was great to see Stephen Boothby back doing a half marathon after his bike accident last year – welcome back. But club trips are about more than just running, it is about meeting new friends and great to catch up with Gosport runners and the Romania runners who joined Redway Runners runs last summer. The Robin Hood bar probably needs a mention – not sure too many of us remember the evenings spent there. 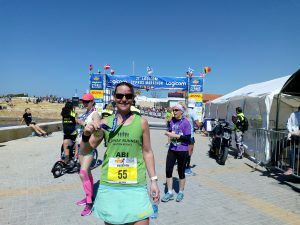 Thanks also to Katie for recommending Cyprus for this year’s club trip and putting on some extra sessions for Redway Runners to attend with core sessions and talks. A lot of people have been already asking about the next club trips, we already have details for the September 2019 trip to Tallin in Estonia and for 2020 following several requests and recommendations we are looking at Malta, but more details to follow as soon as we have them.